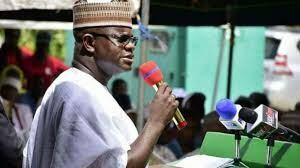 The Executive Governor of Kogi state, Mr. Yahaya Bello has apparently challenged the Ekiti State Governor, Ayodele Fayose to a “Stupidity” contest. He made this challenge at the All Progressives Congress (APC) mega rally in Ekiti State while campaigning on behalf of the party candidate, Kayode Fayemi. While addressing the crowd, he regretted not being around when it was reported that the Governor of Ekiti state had allegedly disrupted a peace parley organised by INEC in the state earlier in the week. He assured the crowd that they will not be intimidated by Ayodele Fayose because “Nobody has a monopoly of stupidity, we shall tame him” which could literally be interpreted as having a substantial share of stupidity. “I want to talk, I want to yarn. There are two categories of people I want to address here today. First, the Nigerian youth, secondly, the Kogi citizens that are living in Ekiti state. Yesterday, we entered into a covenant with Nigerian youth in Ekiti state. When we were coming yesterday from Kogi state, we decided to come by road to address my people. He continued his address further by tracing kogi ancestry and how they had settled in Ekiti state a long time ago which confirms that they are also stakeholders in the state and he was there on a legitimate mission. “We heard that there was stakeholders meeting and there is someone called Fayose, and he disrupted it. Wallahi, he is lucky that I was not there. Anyway, that one is by-gone. Saturday, we will send him packing from governance. I will be here with you. Nobody will intimidate you. The Ekiti State gubernatorial election is scheduled for July 14.